Posted on Jan.25, 2014 by Barry Bookmark the Permalink. The legend is back! A modern version of the legendary instruments designed and built by Gon Bops founder Mariano Bobadilla. Vintage character has been preserved using traditional counter hoops, Gon Bops natural hide heads and Durian wood construction. Traditional welded bottom ring design eliminates cup washers for extended tuning range. Made of Thai Oak, the Pearl Richie Flores Signature Bongo drums are very warm and piercing. 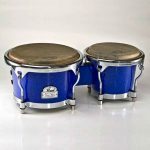 The buffalo skin heads are 7" and 9" for a full Cuban style bongo. Rims are contoured and the finish is eye catching in Lunar Eclipse. The Pearl Bobby Allende Bongos feature a fiberglass body with plenty of high end! They are 7" and 8.5" drums with contour rims. Bobby helped design these bongos with projection and articulation being the main features. They are available in Confetti color. Heads are Remo synthetic. 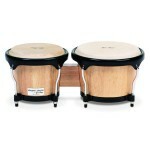 Pearl Primero Bongos are reasonably priced, intermediate level bongo drums with 6" and 7" heads. Available in Thai Oak with a natural finish or in black Fiberglass. 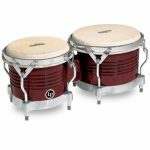 Gon Bops Fiesta Bongos are ideal for students and recreational players, or the perfect set of grab-n-go Bongos! 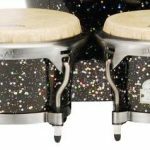 Designed with many of the same features found in top line drums, Fiesta Bongos offer tone and durability typically found at a much higher price point. Built from plantation-grown Parawood, Fiesta Bongos are available in a variety of cool colors: natural, yellow, red and black. A 9.75" Bass Bongo is also available. Fiesta Bongo Natural #FS785N is on the left. Professional quality drums with an affordable price tag. 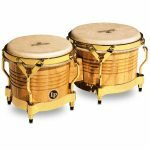 The LP M201-AW Matador Bongos in Natural Wood w/ Gold Hardware feature Siam Oak shells and traditional gold rims. The 7 1/4" and 8 5/8" heads are made of natural rawhide skin. 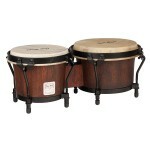 These are rugged bongos made to endure and have a bright, natural sound. A tuning wrench is included. Professional quality drums with an affordable price tag. The LP M201-ABW Matador Bongos in Almond Wood w/Chrome Hardware feature Siam Oak shells and traditional chrome rims. The Almond Wood/Chrome Hardware combination is very appealing. The heads are made of natural rawhide skin and sizes are 7-1/4" and 8-5/8". 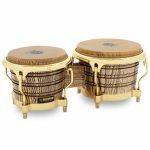 These are rugged bongos made to endure and have a bright, natural sound. A tuning wrench is included. Made of North American Ash, the LP Galaxy Giovanni Bongos are superior in construction and sound. They have a steel backing plate to avoid cracks if the drums are dropped. The invisible glue joints in the wood staves are "invisible." The sizes of the handpicked rawhide heads are 7-1/4" and 8-5/8". 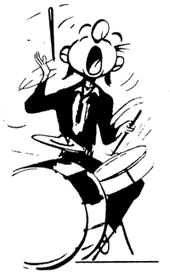 These bongos are most effective on stage for their appearance and sound.